It's getting close to Easter but I don't think that this bunny bento swings that way. The food from foreign countries often scares me, especially dishes with vegetables in them. And those spices, yeooow! 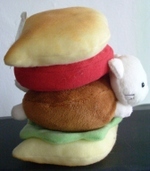 I did think the catburger was cute, but I couldn't eat that. There's tomato in it, and it's too tall for my mouth. I'd have to cut it with a knife and fork. And in my mind, the eating of burger with a knife and fork, is just wrong. Cutting a burger in half, that's just wrong. I don't know where I get these ideas from but I know they feel right. That cat doesn't look that well done either. I need my meat to be well done, which is why I wouldn't eat sushi. 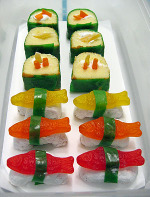 These Swedish fish sushi still wouldn't get me to try sushi, unless it's all made out of sugar. I don't think that candy and rice should go together, especially wrapped in sea weed. It just seems wrong somehow. So does this lady in a bath of Cheetos. What a waste of Cheetos, and somehow lickin' that girl clean wouldn't be so much fun when the cheese powder gets caked on your tongue and goes up your nose. I must be gettin' old. Since I was young I have prefered the taste of Hawkins Cheezies to Cheetos. It's a Cheeto like snack food that you find in Canada. Cheezies are denser and have corn meal mixed in the cheese powder. It gives them a bit of a gritty texture. You can only buy them in Canada, but there are online stores that sell them. Here's a guy on eBay who also has Canadian Candy, some of which are better than US Candy. The chocolate is better than in your average US candy bar. British Cadbury's is like that too. The chocolate is not so waxy. Cadbury bars made in the US are inferior to their Canadian or British counterparts. My problem is I am supposed to be getting off the junk. But I hate to give up that sweet, sweet, chocolatey goodness. Ummmmm, Chocolate. Oh, yeah, and caramel, I motherfuckin' like that. Umm, umm, good, baby.